Here's an absurdly simple reason why Amazon's (AMZN - Get Report) stock broke the $1,000 mark this week: the company continues to be a ridiculously popular place to shop. In fact, old school retailers such as J.C. Penney (JCP - Get Report) , Macy's (M - Get Report) and Kohl's (KSS - Get Report) should be embarrassed by how dominant Amazon is right now. 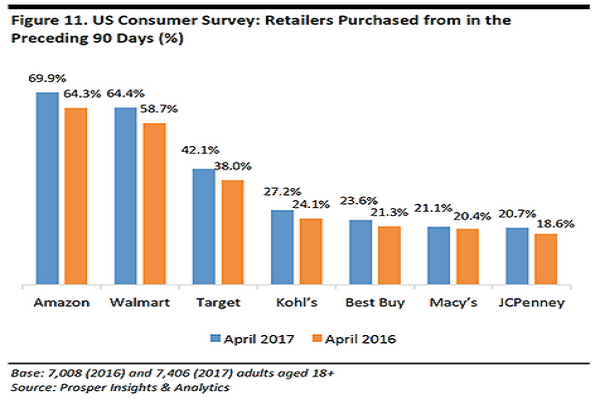 According to new research from Fung Global Retail & Technology on Thursday, Amazon is by far the most popular retailer in the U.S. An April survey showed that almost 70% of U.S. adults polled in April had purchased stuff from Amazon in the previous 90-day period. That number is up from about 64% a year earlier. The next popular place to shop was Walmart (WMT - Get Report) , with the competition dropping off sharply thereafter. Not a surprise being left off the list was Sears Holdings Corp. (SHLD . Editor's Pick: Originally published June 1.